Above: one of our patients playing a game called Multi-Matrix. It trains eye-tracking, eye-hand coordination and visual motor integration. Summer is half way over, is your child ready for school in September? One of the fundamental skills for a child's development is called Visual Motor Integration. Figures above were produced by one of our 9 year old patient who was diagnosed with a deficit in visual motor integration. The first half of the page is pre-vision therapy, and second half is post-vision therapy. The development of visual motor integration is a learned process, starting in infancy. Here is a table of visual motor milestones. Children who do not have good visually-guided motor skills will benefit from both vision therapy (visual perceptual assessment) and occupational therapy. 1. Daly CJ, Kelley GT, Krauss A. 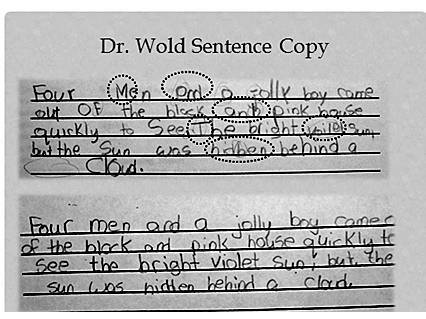 Relationship Between Visual-Motor Integration and Handwriting Skills of Children in Kindergarten: A Modified Replication Study. American Journal of Occupational Therapy. 2003; 57:459-462. 2. Kulp MT. 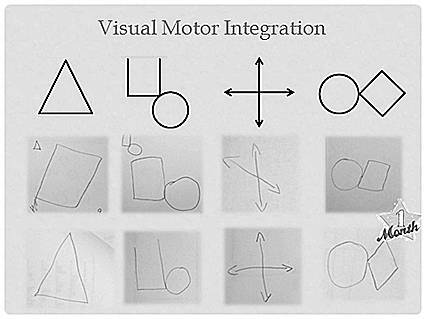 Relationship between Visual Motor Integration Skill and Academic Performance in Kindergarten through Third Grade. Optometry and Vision Science. 1999; 76:159-163.